Photo courtesy of the Marine Environmental Research Institute. 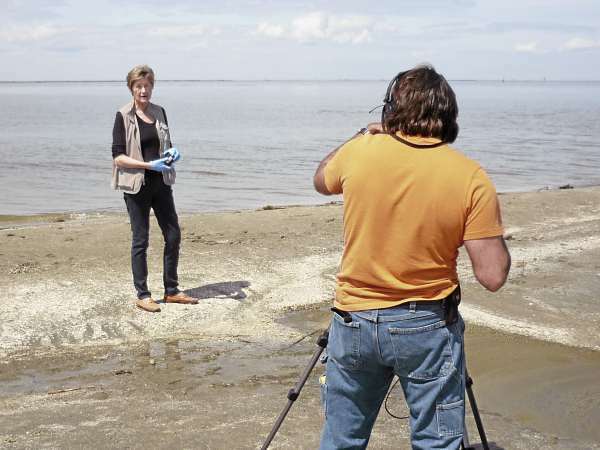 Dr. Susan Shaw of the Marine Environmental Research Institute in Blue Hill displays oiled beach sediment samples from Grand Isle State Park in Louisiana for an Animal Planet documentary. Shaw returned to the Gulf area to gather soil and water samples and specimens of shellfish and fish as part of MERI's Ecotox program, which is studying the effects of the Deepwater Horizon oil spill on the Gulf. BLUE HILL, Maine — A year after the explosion on the BP-Deepwater Horizon offshore oil rig in the Gulf of Mexico, the oil that spewed from the damaged rig continues to have an impact on the Gulf Coast environment, marine life and coastal residents, according to a Blue Hill scientist. Shaw dived in the gulf last July while oil was still gushing from the damaged oil rig and was there again last September. She returned March 12-13 to continue collecting samples for MERI’s Gulf Eco-tox Project, an independent investigation into the effects of oil and chemical dispersants on marine life. The Deepwater Horizon was damaged in an explosion on April 20, 2010, that killed 11 workers and sent an estimated 205 million gallons of oil into the gulf. Barataria Bay in Louisiana, is a heavily oiled area, she said. The marshy areas are black with oil, and very little is living there. Also, very few birds live in the area, where thousands of coastal birds once came to nest. During her time there, Shaw said, she saw only seven birds. “All the small creatures that should be there in the sand — the mussels and crabs — are all dead,” she said. The scene at Grand Isle State Park, also in Louisiana, appears to be almost normal, with white sand beaches stretching along the shore. But beneath the surface, there is oil. The problem is not only below the surface. In the tidal pools nearby, she said, there was a sheen of oil on top of the water. That sheen poses a danger to the dolphins that regularly visit the area, she said. At Grand Isle, dolphins visited the lagoons near where Shaw was collecting specimens. Researches already have documented 400 dolphin deaths along the coast, including 100 just since January. Half of those were baby dolphins that either were stillborn or newborns, she said. It is still early in the dolphin calving season in the gulf, she said, and, within the next six weeks or so, between 3,000 and 5,000 dolphins are expected to calve in the region. Other researchers have documented plumes of oil and dispersants, the chemicals used to break up the oil spills on the surface, in the water column and oil deposits that have created dead zones on the sea floor. “The dispersant-oil mix is extremely toxic, and it’s still in the gulf in large amounts,” she said. Researchers are only beginning to see the effects from those deposits, she said. The impacts are not limited to the environment and the small marine creatures. One of the most dire consequences of the oil spill may be its effect on the people living along the Gulf Coast who were exposed to the toxin. 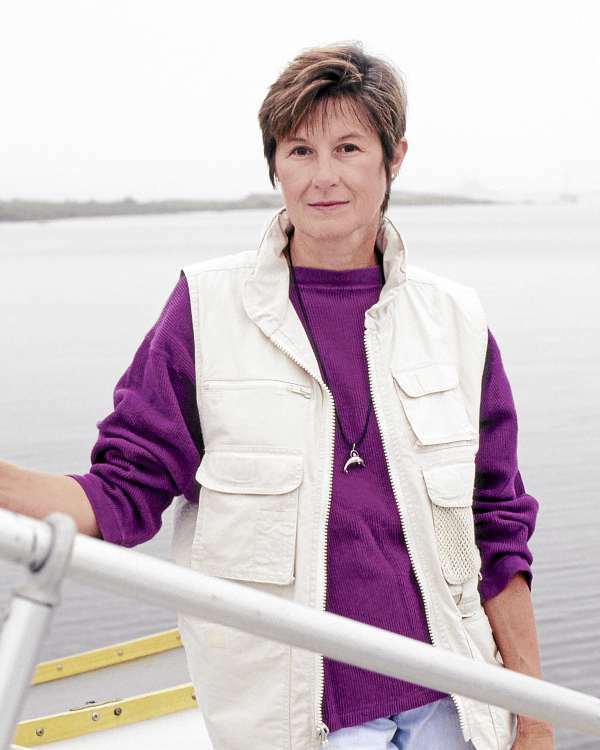 During her recent trip to the gulf, Shaw said she interviewed a number of coastal residents, some of whom had participated in the cleanup often without proper protective gear. Many now are reporting serious health problems with symptoms that have included vomiting, breathing problems, enlarged hearts, weight loss, headaches and internal bleeding. Shaw warned early on of the effects of the dispersants, and she reaffirmed that concern this week. Corexit 9524, the dispersant used early in the containment and cleanup effort in the gulf, contains chemicals that, she said, can attack red blood cells and cause internal bleeding. She said that doctors in the gulf area have found evidence of oil-dispersant chemicals in blood samples taken from residents there. Those types of health problems are likely to continue, Shaw said. Shaw called for governmental action in the gulf. She said the nation needs to invest more resources into research in the gulf to study the impact of the oil spill and also needs to take legislative action to prevent other such accidents from happening.